A horse herd is like a big family. We have come to understand that the peace of mind of any horse is the existence and relative stability of his herd. 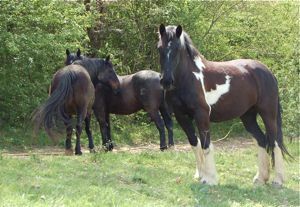 For horses in the wild, the herd means everything… safety, ability to find food and shelter, and ultimately their genetic viability. This is the way horses have evolved, we can't change that in our lifetimes. If we want the best out of our horses we must find a way to incorporate it into how we manage them. They are intelligent individuals, they have complex relationships. Sometimes they have lifelong romances, sometimes many different relationships, just like us. One of the tragedies of our age is the insensitivity we display in keeping horses on their own in stables and separate in fields. Of course we cannot recreate in our domestic circumstances the freedom and independence of wild horses. It is our responsibility however to give them something else, which can be just as fulfilling for them and us. Firstly we as humans, can't replace the relationships they have with their own kind and shouldn't try to. The more relationships they can have with each other the better. Secondly, we can form a whole new kind of relationship, between them and us. There is a beautiful connection to be made with horses on an emotional and a physical level, but to allow this to come about we first have to let them develop themselves through their own relationships with each other. Recently we took a young horse in for training. He was living on his own, unfortunately, and when he arrived and saw all the horses he became desperate (as you can imagine) to meet them all. He wanted to rejoin society. As we were limited (for certain reasons) in terms of what we could do for him, we took an older mare from the herd to be a temporary companion for him (she was already quite keen on him!) and they were very relaxed together. The next day however, the fence separating the herd from them was neatly broken (we use fairly flimsy electric fencing - it's better if they injure the fences than themselves!) and the whole herd had joined them. As well as taking advantage of a bit of extra grass, the main aim of the mission was clearly to retrieve Ellora (the older mare) and restore the herd. Interestingly they weren't overly concerned by the young newcomer, instead one of the oldest passive leader-type geldings of the herd took Ellora away and guarded her for the rest of the day. Normally Ellora is quite low down the hierarchy, but this does not, we realized, mean she isn't important, and we could see how proud she was to be 'rescued' in this way! 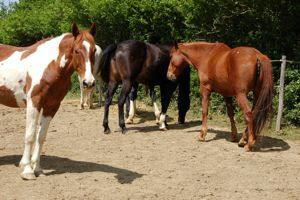 Look at Understanding Horse Herd Dynamics for an account written by Naomi Sharpe, one of our previous working pupils, based on her observations of a horse herd in the US. Just as piglets are rarely, if ever, squashed by their mothers in wild or free range situations, horses are highly unlikely to cause each other serious injuries in a herd situation. Assuming they are barefoot of course! They will not compensate their behavior for metal shoes, and even a playful tap can be transformed into a damaging blow. In fact the spacial awareness of horses is impressive, particularly when they can feel their feet properly (go to horse hoof care for more information about barefoot) and they do know where they are landing a blow, and why. What is really interesting is that there is more to it than just self expression. The interaction between horses is difficult for us to see because we don't see energetic patterns in the way they do. To get more of an insight into this read horse whisperer Nicci Mackay's book Spoken In Whispers). It is possible for us to become more aware of energy in this way, it is a sense we all possess innately, but as we tend to focus more on our intellectual development this perceptual ability often remains unrealized . At the horse fair in our local town, we saw one of the most stressed, unhappy horses we had seen in a long time, tied to a tree and kicking at everyone in sight! Her story is an interesting one. When she was going through her period of 'rehab socialization' in the herd, for two years she was covered with bites. 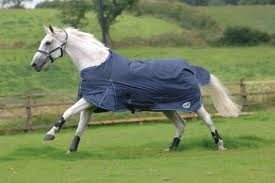 Mainly in the summer because the rugs protected her in the winter. At the time we decided we had to persist because otherwise she would never develop the necessary social skills to be accepted by the other horses and therefore she would never be happy and neither would we! Since then we have learned a bit more about why the horses were biting her in this way. Partly it was because she wasn't aware of the social rules and she had no concept of her place in the herd etc.. but in working with her therapeutically, we realized that she spent most of the time in those first years of her time with us in a state that I term 'vacancy'. The trauma of her previous existence was so difficult for her to cope with that she didn't stay with it, but would 'tune out' and become blank and not present. This is a very common response horses will make to their inner or outer environment in domestic situations when traumatized. You just have to go to most riding schools and look in the horses eyes to see what I mean. There is often no one home. In Odette's case the others were trying to bring her back into herself when they were biting her. They may not have realized that that was their intention, they were simply responding intuitively to her energetic numbness. Four years later she is one of the more dominant mares of the group, and has many friends (she is the dark bay mare in this photo) one particularly close - Hope, the chestnut mare on the right. The horse most likely to injure themselves is a stressed horse. Solitary horses are stressed, however calm they may appear. A solitary horse given some freedom i.e. put out in a field, or an arena, will often attempt to rid himself of this anxiety through movement. Galloping, bucking, twisting and throwing themselves about. When this happens in a small paddock without enough room for the horse to avoid constant turning, and if the horse is shod and his feet are numb (see Natural hoof care) if he's been confined to a stable stiffening up for hours and he's past caring how much he hurts himself because he's so lonely and depressed, it's not really surprising when he twists his fetlock or jerks his back. It's amazing how tough horses are naturally, but we do weaken them by restricting their movement and limiting them to banal environments. It's great to see the whole herd enjoying themselves, rearing and charging, passaging and bucking like lunatics, and not have to worry that they will hurt themselves. As a horse owner, allowing horses to develop their natural resistance gives you a much more profound peace of mind than that which you may get from trying to protect horses by wrapping them up in cotton wool. 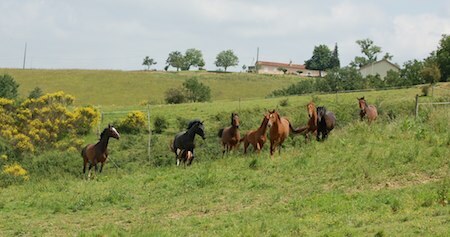 We have a main herd composed of seven mares and four geldings. 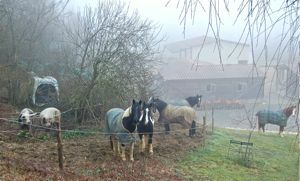 When we are working them and the weather is wet, all the horses come into the stables and the barn (an area with four horses together). It has worked out over time that the mares are in the stables and the four geldings are in the barn in two pairs. When the weather is dry and there is no need for the horses legs to dry out, we prefer to keep them out, and bring them in just for their work. We find they are much happier not being stabled, especially later on in the day, and there are no problems with swelling legs or stiffness. We do use rugs whenever it is necessary for several reasons. Partly because the horses don't have a shelter in their terrain that they could all use, and we are restricting them to that terrain. It keeps them cleaner so it's less work for us, and they also need more food to manage without rugs when they are working as well. We also clip certain horses who tend to sweat during their work, they are much happier as long as they are rugged properly. With our schedule, we don't find that these horses need more than a low trace clip. We find that because their default position as a herd is outside, when they do come in, the horses do really enjoy and appreciate it. Like anything, the joy is in the contrast. They associate their stables only with food, rest ad shelter. It is a good idea to try to avoid anything stressful happening for horses inside stables. For example separation from a friend, or any kind of weaning process. It isn't a natural thing for a horse to be shut into a small area, but if they associate it only with good things they will enjoy it for a while. It isn't necessarily a good thing for horses to get too hooked on a routine. That seems like another form of institutionalization, the same mindset they can develop when they are out in a field all the time instead of more interesting terrain. We find it works better just to keep them contented all the time. If they are never hungry and never bored they won't need to depend desperately on precise times for feeding. We do tend to follow a basic order of event's in the day, but it keeps them more present not to be too rigid. The other herd we have is a smaller group of five members which came about when we rescued Rafael, a little Spanish horse about to be put down because he was unrideable (he is furthest right in the photo below). One of the key reasons for his behavioral problems we discovered was hormonal, he is a cryptorchid, also known as a rig (he has a retained testicle which gives him testosterone levels almost as high as a stallion, but he is not fertile). Rather than put him through the operation to have him gelded properly we decided he was himself like that, and at first we put him with a mare, her yearling filly and six month old foal. Before we knew for sure he was a rig we had gone through the process of joining him into the herd, but we realized pretty soon it wasn't going to work out when he made a violent takeover of the mares and charged all the geldings into a corner! Anyway, he loved his mare and her babies, and his being contented in himself was a big help for us in repairing the terrible lack of confidence he had in people. Later on he found a new wife and then a mistress! Here he is (in the background) with her in the photo below. In the foreground is one of the two 'babies'. They are all a very happy family, and when they are working, similar to the others, the three adults come into the stables and the babies stay out nearby. The babies are now three and four year olds, and although they accept very well to come in for very bad weather, they are not yet mature enough to stay in for a whole day without getting impatient. Interestingly as time goes on they become happier about it and we prefer to take it slowly. Impatience is the first stage of stress. If it is recognized and responded to then it doesn't progress to the next stage which can be an erratic behavior, such as a vices like windsucking, cribbing, weaving, box walking. Or the response previously mentioned when the horse tunes out and becomes vacant. This can also be called 'dumbing down'. It is often mistaken for calmness, the horse no longer reacts to his environment or takes interest. It is as if his personality disappears. The babies have always been very interested in the work that the adult members of their family do in the arena, and as one of the lanes goes right past the arena, they always come to watch. Especially when they can do something mischievous to distract their adopted mother! 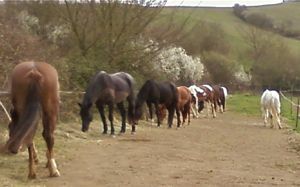 When we feed our horses outside we give them hay along the edge of the lanes, or when it's too wet, in piles in a field area. We give them individual hard feeds outside as well, and even the bigger herd is exceptionally well behaved as long as we hand out the feeds in the correct order of the hierarchy. We don't use hay feeders outside anymore because they tended to root the horses to one spot, eating all day, switched off physically and mentally. We do notice that when the horses are on a holiday of longer than two weeks, they become more active in their environment as they forget the routine of standing in during the day. Even the small amount of time we keep them in the stables has a certain switching-off effect. As we continue to evolve our routines for the benefit of the horses we are always staying open to new possibilities and improvements. Go to Our Paddock Paradise for more information on the ideal herd environment.